Home distillation is also more economical than other alternatives. It’s far less expensive than bottled water. For example, an efficient distiller makes a gallon of fresh distilled water at home for about 25 cents vs. bottled water at 89 cents. Home distillation is convenient. You never have to run out for water between shopping trips and there are no storage problems or heavy bottles. 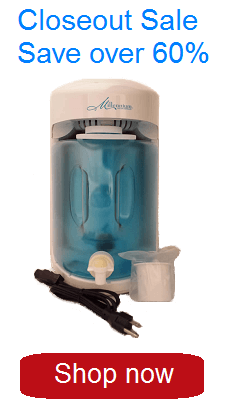 There is no worry about the quality and freshness of homemade distilled water. Quality distilled water is odorless, colorless, tasteless and safe. It can improve the taste and color of food and the natural flavor of coffee, tea and other beverages. Distilled water can also increase the life of water using appliances like steam irons, coffee makers and humidifiers. What type of water purification alternatives do I have? Many years ago, you could collect and drink rain water, but generally today even this isn’t safe. Rainwater falls through polluted air containing bacteria, smoke, smog and chemicals. Boiling water, the age old method of disinfection, does kill bacteria…but since some of the water boils off in the process, simple boiling actually concentrates nitrates, salts, heavy metals and other contaminants in the water that is left after boiling. Should I have my water tested? Whether you’re drinking private well water or city water, the benefit of water testing offers only temporary peace of mind since the quality of your water can change even over short periods of time. And at an average cost of $100.00 per test, it’s certainly expensive and…it does absolutely nothing to solve your problem. In an attempt to solve the problem, many people are either purchasing bottled water or in-home water treatment devices. In fact, it’s estimated that one out of five U.S. households either buys bottled water or uses a water treatment device. Let’s consider these alternatives. Is bottled water a safe choice? It seems easy to purchase bottled water. But is this the wisest choice? It’s estimated that 20 million U.S. households have turned to bottled water even though there is little scientific evidence to suggest that bottled water is any healthier than most municipal tap water. While bottled water on the average costs about 89 cents per gallon, much bottled water is nothing but tap water, with little or no processing, which is sold at prices up to 1600 times its initial cost! In fact, 25 percent of bottled waters sold come from municipal supplies with only chlorine and bad taste removed. Legally accepted sources of bottled water are wells, springs and public tap water. Have you ever purchased bottled water at a local store only to discover that the water tasted just the way the plastic container smelled? Water in low grade plastic may leach toxins from the container, such as methyl chloride, a carcinogen. Freshness is also an issue. A recent study conducted by Northeastern University reveals that bacteria can indeed breed in bottled water. Elevated levels of bacteria can cause intestinal problems, diarrhea and nausea. Bottled water offers you no true peace of mind nor does it guarantee consistent purity. A water softener treats hard water simply by exchanging sodium for hardness minerals such as calcium and magnesium. Although removing hardness minerals helps soap and laundry detergent dissolve more easily, softeners have little effect on bacteria and do not remove synthetic chemicals or heavy metals like lead. Softeners are limited in their ability to purify water for drinking purposes and because sodium is added, softened water could present problems for people on low salt diets. Filtered water has passed through a fine strainer and/or activated carbon. While carbon filters reduce disagreeable tastes and odors like chlorine, they are not effective in removing contaminants like arsenic, copper, lead, nitrates, parasites, sodium, sulfates… and the list goes on. And, a filter can also become a breeding ground for bacteria as the organic material which remains in the filter begins to decay. Another drawback is knowing when to replace the filter…bells don’t ring, lights don’t flash. Manufacturers suggest replacing filters when bad taste or odor returns but, in reality, a filter may be able to control tastes and odors long after it has lost the ability to reduce tasteless, odorless organics such as trihalomethanes. Thus, even with periodic replacement, filtered water may contain more contamination than unfiltered water! Try asking a filter salesperson to guarantee purity. Reverse osmosis (RO) systems force water under high pressure through a synthetic semi-permeable membrane to reduce inorganic minerals. However, these systems vary widely in their ability to reject nitrates, chlorides and some other contaminants. RO performance is affected by water pressure, water temperature, pH, bacteria, dissolved solids and the chemical contaminant level of raw tap water. An RO system works by flushing contaminants out with additional quantities of water. This process can send as much as 6 gallons of wasted water down the drain to produce only one gallon of treated water. Put into perspective, this means producing 3 gallons of RO water per day would waste approximately 6,000 gallons per year! Like other filtration systems, gradual clogging will result in declining effectiveness and can also lead to contamination from bacterial growth. Faced with so many discouraging drawbacks to alternative sources of clean, pure drinking water, it seems only natural to wonder whether there is any guarantee that the water you’re drinking is the purest possible.